Goldenoldy – Life in the Senior Lane: Looking back while moving forward. “The Sound and the Fury” with my Compson family tree notes to help me keep that dysfunctional clan straight! A big thanks to Betty Burton, who heads up the library’s adult programs, and Phil, a seasonal Vineyard resident and English Professor at Swarthmore College. Oh, he’s also the author of “Becoming Faulkner: The Art and Life of William Faulkner,” former head of the William Faulkner Society and has published papers including “Faulkner’s Subject: A Cosmos No One Owns” and “What Else But Love? The Ordeal of Race in Faulkner and Morrison.” He knows of what he speaks! At Swarthmore, his courses have included: “Faulkner, Morrison, and the Representation of Race” and “The Subject in Question.” That offering is described as follows..
How do we become who we are? What social discourses and practices enable the shaping of identity? How does reading affect this process? This course will explore the ways in which subjectivity and ideology interpenetrate within a range of texts and our commentary upon them. Writers will include Shakespeare, Flaubert, Kafka, Faulkner, Rich, Morrison, and DeLillo. Theoretical essays may also be assigned. Isn’t any humanities course that addresses a question like “How do we become who we are?” a must for young adults?! Recently, The New York Times ran a page one story that caught my attention: “Interest Fading in Humanities, Colleges Worry.” Yikes! That is worrisome. Not surprisingly, the fear is that the humanities are loosing favor to STEM offerings. Not being a STEM herd, the acronym was new to me. It’s the term for science, technology, engineering and mathematics. No wonder. Whenever possible, I avoided the STEM Gang like the plague in any of my past centers of higher learning. The article points out that “while humanities majors often have trouble landing their first job, their professors say that over the long term, employers highly value their critical thinking skills.” I mean who would you rather sit next to at dinner, a STEM nerd or Phil Weinstein! The humanities can be described as the study of the myriad ways in which people, from every period of history and from every corner of the globe, process and document the human experience. Since humans have been able, we have used philosophy, literature, religion, art, music, history and language to understand and record our world. These modes of expression have become some of the subjects that traditionally fall under the humanities umbrella. Knowledge of these records of human experience gives us the opportunity to feel a sense of connection to those who have come before us, as well as to our contemporaries. Don’t we have to better “understand our world” to make it a better one…albeit with the help of technology in getting the message across, for example, via social media? At Stanford, the history department’s courses “teach the foundational knowledge and skills (analytical, interpretive, writing) necessary for understanding the deep connections between past and present.” Outmoded thinking, not applicable to solving today’s conflicts around the world? Hardly! Alas, Stanford is out of reach for me – geographically and academically. But I’ve got the little library that could and does help me understand the world in which we live. 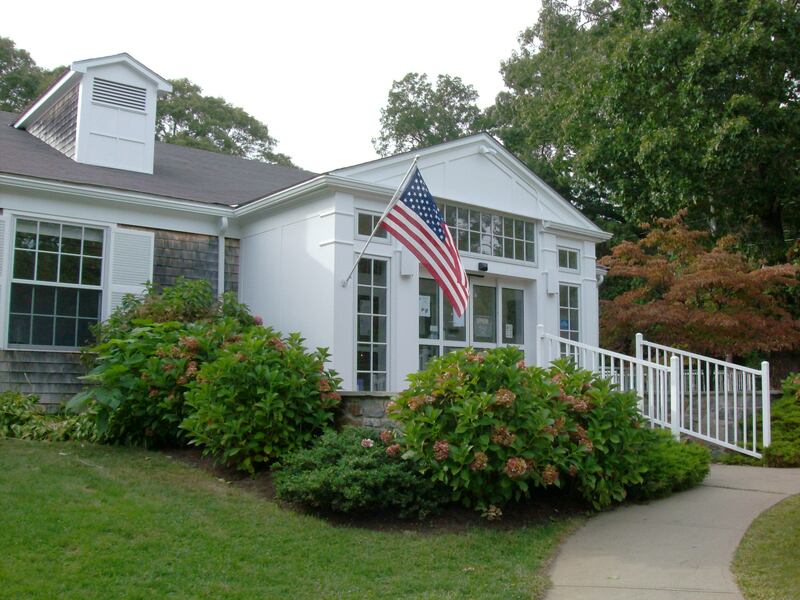 The Vineyard Haven Public Library, a stone’s throw from our house. Lucky me. Years ago I did a school paper on the 19th century artist Mary Cassatt. I remember the laborious job of researching, hunting down tidbits in the library. Alas, no internet to speed the project along. So, I was taken by New York magazine’s clever interpretation of Cassatt’s “Girl in the Garden,” 1880-82, on the cover of its September 19-October 2 issue (above). This girl is not contemplating the botanical wonders around her, but intently studying her iPhone, EarPods firmly planted to drown out any bird tweets or other natural sounds found in such a setting. Inside the magazine, the altered paintings are just as eye-catching. Take Edouard Manet’s “Le déjeuner sur l’Herbe,”1863 (above), where one of the picnic diners takes a photo with his iPhone of the couple he is with; or the depressing portrait depicted in Edward Hopper’s “Hotel Room,” 1931 (below). Here, a lonely woman types out a text. Read the story, even if you have to do it on an iPhone. Then I came across a book review with quotes from the book describing the person in the book’s title. I found the quotes hauntingly familiar. It sure sounded like the book’s author could be talking about traits found in one of our Presidential candidates. With all this talk about Donald Trump calling a former Miss Universe, Alicia Machado, “Miss Piggy,” among other unflattering names, it got me wondering: How many pounds is the candidate carrying around? He usually appears wearing a jacket that camouflages any protruding girth, but here’s a photo where the man looks terribly tubby. His doctor recently reported that Trump weighs 236 lbs, making him overweight and on the verge of obesity for his height, 6′ 3″. He’s just five pounds shy of being labeled obese under the body mass index. Obviously Trump is not interested in setting any kind of healthy example with a sane diet and wise exercise regime. He likes to boast about his unhealthy eating habits as he demonstrates by wolfing down McDonald’s hamburgers and buckets of KFC friend chicken. “I work out on occasion…as little as possible,” he said at a 1997 news conference during which he mocked the weight of reporters. OK, call me sexist. But can we talk about this scary trio, particularly their coifs, although I know we could say so much more about these lads than something so insignificant as what swirls on top of their heads. Like what’s inside them!! Take a look: The Donald and two of his faithful, the unkempt Steve Bannon (top right), CEO of Trump’s campaign; and Trump’s Medicine Man, Jacob B0rnstein. I wonder if he wears a hairnet when examining his patients, like food workers do. Quick! What weighs 5 pounds and is 900 pages? No, not My Wallflower Years Revisited, the abridged version. But this read is just as riveting. It’s Shakespeare’s First Folio and you may get the chance to see it up close thanks to a traveling exhibition, “First Folio! The Book That Gave Us Shakespeare.” The Folio (below), published in 1623, just seven years after the great bard’s demise, collected 36 of Shakespeare’s plays. The book is on loan from the Folger Shakespeare Library in Washington. “In a moment where information seems to be everywhere,” noted Michael Witmore, director of the Folger, in an interview, “it’s startling to be reminded that the sole conduit of some of these incredibly influential plays is a physical object made out of rag paper.” Yes! This nugget of information comes from “Bloomsbury at Home,” a wonderful book chronicling life in the various homes of the impossibly talented Bloomsbury set, circa late 19th century, early 20th, one of those bygone eras of mucho letter writing for sure. I know, I know, today we tweet and text and that prose is delivered in lightening speed that would leave the stunned Dowager Countess of Grantham grasping for her smelling salts. But check this out. Here’s a couple, profiled on a recent “Sunday Morning” (CBS) segment, who may not be into letter-writing, but they’ve managed to create a digital literary keepsake that harkens back to the good old days, sort of. It’s not exactly a diary of letters – Patrick Geraghty and Kristie Damell never wrote letters to one another, but a 21st century slant on one. “We had a whole history by text,” Patrick noted. So, this paragon of a husband printed those text messages (from the day they first met through their first anniversary) had them bound in a hardcover album (below) and presented it to Kristie on anniversary No. 1. Anymore where he came from? Now, something for the small fry. How cute is this! The name, the colors. Fab. Turtle Mail is a small wooden toy mailbox (above) for kids that prints messages sent via Wi-Fi from its web or desktop app. The idea came when one of the founders, Alysia Finger, noticed that when her daughter turned one-year-old, for gifts she was getting “really flashy electronics that felt like they were built for adults and just wrapped in rubber and plastic and marketed as kids products.” A word to the wise: “What I heard over and over during my interviews with parents and caregivers,” Finger told “Wired” magazine, “is that they were exhausted with screen time, apps, and video games…Many expressed how hard it was to get their kids off of computers and tablets.” Gee, what a surprise…For more about Turtle Mail go to: http://aedreams.com/turtle-mail/.